The number of times we feel like what we have is just not enough. Like if we were given just a bit more life would be much better or more beautiful. Yes … No? Like we are inadequate, be it in material things, what makes you up, what others offer you. Like you could have better, get better or be better. Of course if you had more than what you have now, it would be much better but what about now? ‘I don’t have’ always seems to be the most ideal response to ‘do you have’. It rolls off the tongue with so much ease it almost seems right…wrong? Why would we subject ourselves to not having when we actually have. It could not be enough, but at least you have something even if it comes in small doses. ‘I don’t have money’, ‘I don’t have clothes’, ‘I don’t have time’, ‘I don’t have friends’, ‘I’m not loved’, ‘I’m not good enough’, ‘I don’t, I’m not … ‘ I could give a whole range of example of the number of times I say this myself. Then out of the blues I figured, when I say this at least I have a shilling or two in my wallet or bank, I probably need another wardrobe to fit in my clothes, I have at least a handful of friends whom I know will be there for me, I am more than loved, I’m work in progress into the best. You have, you have so much, only thing is that it’s never going to be enough. Point in case, the number of times I say, “I don’t have clothes, shoes, bags” O_O *frantically shaking my head*. Yes I know, some shame shame on me. When I was moving out packing all that stuff, carrying them and finally re-arranging them was a back-breaking activity. This is what I had to ask myself, “Really Kawria really! How many of these clothes, shoes or bags do you even wear or carry?” Answer, ” A very small fraction. It’s from that day hence forth I was like I will stop ranting and start appreciating what I have by using it first. The number of new things I have acquired and don’t use – countless. This could be because I don’t see what I have as enough, so even when I get more, I don’t feel like it’s still enough. However, if I learn to use what I have (like wear my variety of clothing, carry the different bags, wear the different shoes) then it would be easier to identify my needs and buy stuff that I need more, and not just accumulating the same thing (seeing as that’s not even progress in itself). What to do now? Well, since we are humans and needs and wants are going to arise every minute, of every second let me leave that description there how about we be content with what we have, learn to appreciate it, use it and see its value. Then we will be able to create room for more, more of what we actually need and not what we think we need. This actually makes acquiring more worthwhile and even as we aim higher, we will know where we are coming from and where it is that we want to head. You won’t get overwhelmed by having more, it will actually be easier to manage it. What about of matters of the heart? 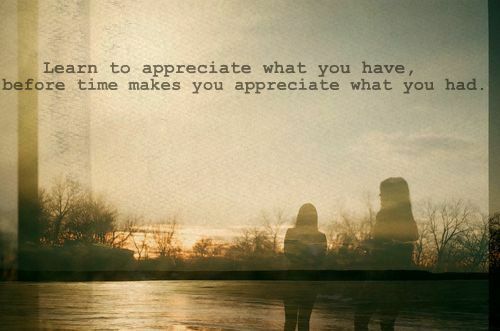 I say, appreciate whoever it is you have now (yourself, family, friends, spouses) … Love more where you can, care more where you can, always be there when you can. So that in future when you look back, you don’t say, “I could have done better than that”. At least for once you can have a chance to say, “I did the best I could”. When you do all that, whether it works out or it doesn’t work out for whatever reason, then don’t regret it because at that particular moment you put your best foot forward and it made you happy. Now, ‘if saying was as simple as doing’ … lol. I’m pretty sure that’s what in your head right about now, but what’s impossible really? This sure ain’t one of the impossibilities so it can’t be an excuse. Mellow Monday … yeah even the weather calls for it. Smile at someone today and make their week a bit better, be that sunshine for them. Have an awesome week ahead.